The games produced by Bally and Stern between the years of 1977 and 1984 were enormously popular with players when they first graced the arcades, and remain popular to this day. Given the sheer number of games originally produced during the 1977 to 1984 run by Bally and Stern, the survival rate is very high and there is a great demand for reproduction parts to keep these games running properly. This is the second review in a continuing series where Credit Dot will examine some of the reproduction parts being manufactured, and how technological innovation is making Bally/Stern games look and play better than ever. Two weeks ago, I reviewed the Retrofit Conversion LED Display Kit available from Pinitech that took your original, non-functioning Bally/Stern displays and converted them into fully functioning, LED equipped, low-voltage displays by removing old components and adding new new components to drive the 5 volt LED digits. These kits, which require the end-user to provide donor boards and assemble the kits themselves, have been on the market for about a year and have taken countless out-gassed displays that were sitting on collectors’ shelves and put them back into operation at a fraction of the cost of a complete aftermarket plug-and-play display set. I’m happy to share that Pinitech has again revolutionized the classic Bally/Stern display market by offering LED kits that do not require a donor set of displays to convert. In addition to the revolutionary Retrofit kit, Pinitech has now launched two complete all-in-one display systems that can be sold to the end-user, in kit form, that look just as good, if not better, than any aftermarket display kit currently available: the TRADITIONAL 2-Board Full LED Display Kit and the UNO Single Board Full LED Display Kit. Perhaps more importantly, like the Retrofit before them, their cost won’t break the bank. I’ll begin by re-introducing the the Retrofit Conversion LED Display Kit, but the full review can be found here. Simply put, it requires a set of original donor boards. If you have dead displays lying around and can handle removing components from the original board and adding new components that come with the kit, this is bar none the most economical, and perhaps best option for you. Now to introduce the new Pinitech releases. The Traditional 2-Board Full LED Display Kit maintains the visual integrity of the original Bally/Stern display, giving the user a two board system—one onto which you will mount the electrical components, and one onto which you will mount the LED display digits. The connection between the two boards is made by way of two male header pins on the display panel and two female header housings on the component board. This board uses the existing metal display bracket of your Bally/Stern game, and will slide in as an original display would. Overall, it gives the same physical look as an original board, with all the benefits of a low voltage, high output display. The second new release is the Uno Single Board Full LED Display Kit. It takes all the components of the traditional two-board system, and arranges them onto a single upright board, display digits and all. The display will then be affixed using the four mounting screws originally used to hold the metal display bracket to the backbox lamp board. It will be “free floating” in the backboard cutout with the only points of contact being the aforementioned mounting screws. No matter what option you choose, assembly is required, unless you’ve pre-arranged with Pinitech to build it for you. The two new kits open the level of entry to those with even a basic knowledge of soldering and board assembly. The Retrofit required the user to de-solder components from original Bally/Stern boards. Both the Traditional and UNO are a complete display system—no donor boards required, no components to remove, no chance of lifted traces. With only simple soldering required, nearly anyone who can follow a set of written directions and has a temperature controlled soldering iron can obtain a great looking set of aftermarket LED displays using either Pinitech kit, and feel a sense of accomplishment when the task is complete. 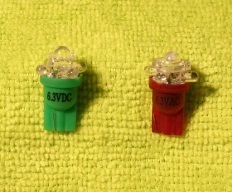 The contents of a single Traditional seven-digit amber display kit. The contents of a complete UNO six-digit white display kit with green filters. Assuming you didn’t have a set of dead displays kicking around for a Retrofit conversion, you’d be looking at, at least, thirty or forty bucks to obtain a dead set to perform the Retrofit conversion upon. If you have the dead displays on hand, and have the skill to de-solder parts and solder in new parts, the Retrofit may still be the way to go. If you don’t have an outgassed set at the ready, the Traditional and UNO provide a great all-in-one kit that will cost less than any other option on the market today. I discussed competitors’ pricing in the previous Retrofit article, but in a nutshell: Rottendog offers their amber plug-and-play display kits for $199USD, X-Pin offers their 6-digit amber display solution at $275USD, while Wolffpac Technologies offers an amber 6-digit DIY kit for $145USD. It is interesting to note that Pinitech’s highest priced kit, the 7-digit TRADITIONAL in white with one colour filter option of your choice, is priced as much as the lowest-level kit from Wolffpac Technologies. The amber kits are obviously the most economical of the Pinitech kits available, but to offer a white set with a free colour option at less than $150USD should be a real eye-opener. With the Pinitech kits, your game can be customized with about a dozen different filter options, allowing you to colour match the displays to the overall scheme of your game, or go off of the prescribed colour chart and add a display that pops against the existing colour scheme of the game. Gone are the days of picking between red, green or blue displays. Pinitech offers magenta, yellow, purple and turquoise–which are just a few of the different options you can choose from to customize your game. WHICH KIT WILL FIT YOUR NEEDS? You can pretty much mix-and-match any of these display options and obtain a uniform look in your game, or collection of games as the case may be. The obvious benefit to the Traditional and UNO display kits over the Retrofit was covered in the outset of the article: you don’t need donor boards and you don’t need to remove components. The kits contain everything you need to build yourself a complete display system for your game. This opens the door for more novice tinkerers to solder-and-go, without having to worry about lifted traces and the plethora of different board layouts that Bally and Stern used during the initial release of the games. Time is also a factor here. After building a few of the Traditional and UNO displays, I got my completion time down to about twenty minutes per individual display, versus the thirty-five it took to complete the Retrofit conversion. 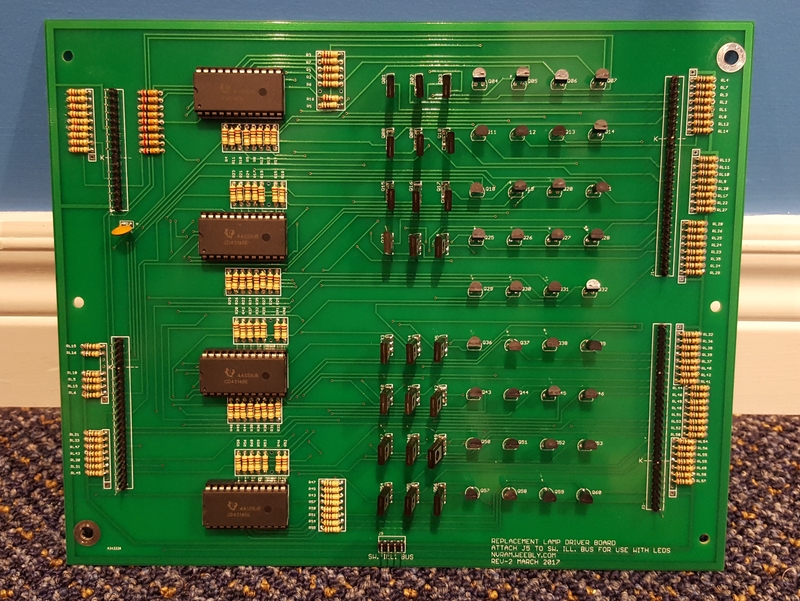 Those extra fifteen minutes are accounted for in the Retrofit conversion by de-soldering components, and double-checking the placement of the new components, as the board layout on the original Bally/Stern PCBs is a bit confusing. It seems those original boards went through more revisions than Carter had liver pills, so each original Bally/Stern display PCB will have components in different places. The Traditional and UNO boards are designed with logic and elegance, similar components are arranged in a row, and there are far fewer points of solder in these builds than there are in a Retrofit conversion. It should also be mentioned that the Traditional and UNO are true 5 volt driven displays by design, not a high voltage display converted for 5 volt operation like the Retrofit. There is no chance to send high voltage through the display at all as the male pin that supplies high voltage to the display has been designed out of these new display PCBs. The Retrofit needed to have Pin 1 pulled to ensure high voltage was removed from the equation, and further, a rather unsightly jumper made from the high voltage line to the 5V line to bring power to the display. If the conversion was done with care, it isn’t really a worry, but the threat is there until dealt with properly. The Traditional and UNO have taken care of that threat through design. There is an added benefit with the Traditional and UNO systems: brightness control. Pinitech proprietor Wayne Eggert factored a potentiometer into the design to subdue the display digits or blaze them bright, as the end user sees fit. This is a valuable benefit, allowing the user to customize brightness to fit the overall look of the game, and becomes even more valuable when using the white digits to dial in the look of the digits through the filter choices. Some of the darker colour filters like magenta or purple can require some added brightness to really make them pop. One of the main benefits of the UNO system is that you can adjust the placement of the display left and right to center them in the backglass display window. Before tightening down the screws when mounting the display, users can now play with the placement, adjusting as needed. Many games from the Bally and Stern catalog suffered from misaligned displays, straight from the factory. This was my experience with my Stern Catacomb. The game came with aftermarket Rottendog displays installed, and the display shift was such that most of the last digit was completely obscured on the score displays, and the credit and ball count display difficult to read being blocked by the backglass art. Using the UNO displays, I was able to make adjustments and slide the UNO over to the left so that all score numbers were visible. This last number in the score was always a zero so it didn’t really matter much, but aesthetically, it was always bothersome. The UNO corrected this completely. Having the male connector pins on the same board as the display digits on the UNO is a difference traditionalists will need to get used to, but having physical displays shut inside of a backbox and behind a backglass should not turn too many stomachs as long as the displays perform as advertised (and they do). As long as the male connector locking mechanism is positioned toward the bottom, away from the display digits, it will allow for a secure fit of the existing connector. Having the locking tabs of the male connector facing upwards, as suggested in an early revision of the instructions make for a fit that is too snug for comfort, resulting in a bit of a struggle to get the connector to fit securely, and further, interferes with a few of the component through holes. Having read a revision of the instructions released after my test build, I see that it has been changed to read that the locking tabs now be placed downwards to correct the issue. The UNO set installed in Catacomb, rear view. Given the choice between the two new display options, I would give the advantage to the UNO. The single board design results in a few less points of solder compared to the Traditional, without ever feeling as if the components are crammed onto the board or unmanageable when installing them. The UNO is also the better value, saving you ten bucks across all options, no matter if your game is 6- or 7-digits, or which colour option you choose. With functionality the same across both options, both looked and performed great in test, I’d go on the record as saying that the UNO is the clear choice. The Traditional kit would be a great option for those that prefer to keep the original “90-degree” aesthetic of the original Bally/Stern board design. It would also make sense to go the TRADITIONAL route if you were mixing and matching with Retrofit converted displays, as the physical look of the boards remains consistent across both options. Pinitech will sell individual display kits if you have a partial set of dead displays at your disposal, and want to fill in the blanks with Traiditional 2-board individual display kits. Credit Dot: When we last talked about the Retrofit Conversion LED Display Kit, you shared that the research and development process of taking an old display and removing/adding components to give it LED functionality took about four to five months to complete. What was the timeline for R&D of the Traditional UNO kits? Were you ahead of the curve having the knowledge of the Retrofit project in your back pocket? Wayne Eggert: The majority of the final full kit design occurred in June/July 2017. Really though, these have been in-development since 2011 to some degree when I was first experimenting with LED display circuits. I had wanted to create my own displays for Bally/Stern games, but at the time, prototyping was going to cost a small fortune and it was looking like even in modest volume, a DIY kit couldn’t come in much cheaper than the less-expensive plug-and-play aftermarket displays. Instead, the project was scaled-down in size and turned into a diagnostic tool in 2013 that I called a “Bench LED Display”. Still having this desire to create a full display, in 2016 I created the RETROFIT kits. They were a monumental step forward, offering collectors a cheap way to create a full-scale display without the risk of a component board that might change several times during prototyping since the component board was already a “fixed design”. The challenges and experience that the Retrofit project offered, and all of the prior years of projects and R&D, are ultimately what helped fast-track the development of these full displays you now see in 2017. 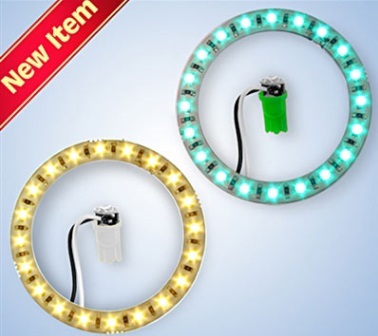 CD: Is there a concern of market confusion having three separate LED kits available for purchase at Pinitech? WE: There was. That’s why I gave them all separate and unique names. The conversion kits are the “Pinitech RETROFIT” kits. For full kits, the 2-board design is the “Pinitech TRADITIONAL” and the single-board is the “Pinitech UNO”. I think between the names and descriptions on the product pages it should help avoid confusion. CD: Having personally built and used each of the different kits, I can attest that the functionality and look from behind the backglass is identical across all kits. What are some of the situations in which a collector would prefer one kit over the other? WE: Some people will prefer the classic looking 2-board design no matter what, but some games will also require it. I have a Stern Black Beauty Shuffle Alley that has a ton of lamp surrounds next to the display brackets and even with heavy modification I don’t see the UNO design working there. That’s going to be more of an extreme case of clearance issues though. For many machines the UNO is going to work just fine and be the way to go with its lower cost, quicker assembly and ability to shift the displays left or right. CD: The UNO and TRADITIONAL display kits are a bit more “builder-friendly”–you need not remove components from a donor board as you would with the Retrofit. Was one of the design considerations of the new kits to make the process more streamlined for the average collector? WE: Yes. All new parts are included with the full kits, so anyone with basic soldering skills and equipment can easily assemble the displays. CD: The Traditional and UNO kits have only been offered for about a month at this point–what is some of the feedback you’ve received from the early adopters of the kits? WE: I’ve heard many great comments. Easy assembly. They look great. They function well. Instructions are well done. It’s a joy to be hearing these things because it means all the time spent refining them was worth it. CD: The UNO itself is a streamlined and compact piece of technology—you essentially placed all the components that were originally on a traditional Bally/Stern PCB onto the surface area that was occupied by the traditional display glass. How were you able to arrange all the components onto one simple board? WE: Pure willpower I think. I was back-and-forth on doing a single PCB design or a 2-board design. I couldn’t decide. I knew there would be cost advantages to a single board, but I absolutely hated all the design concepts I had drawn. It was too clunky and didn’t look like it belonged. But I had this idea to shift the displays left or right and really liked that thought. The single biggest turning point was deciding that I wasn’t going to pick just one style. I was going to do BOTH–and they would look awesome when completed. I just focused on that very positive thought and made it happen. I absolutely love the single board design, it’s so slick looking that I’m even wanting to put it in games. If you asked me a few months ago if I thought that would happen, I’d have had some serious doubts! CD: Now that you’ve eliminated the need for a donor board, do you offer assembly services for the TRADITIONAL and UNO kits, for those who don’t have the time or skill to build them on their own? WE: Yes, I’m offering fully assembled plug-and-play options on both of these displays. CD: Having been a customer for over a year, I can attest that the packaging of your items has grown leaps and bounds, with the UNO and TRADITIONAL sets being shipped in an extremely neat, organized and professional manner. There is obviously “value added” in this sort of packaging? WE: It makes it easier for the customers, as well as myself, to bag and box display sets individually. I often imagine myself as the customer, opening up the box or reading through the instructions. I put myself in my customer’s viewpoint and do what makes the most sense and avoids confusion. CD: The digits you are using for these new kits are the same as the ones used in the Retrofit kits. Are you finding that collectors are appreciating the option of customizing their game using the white digits with the vast range of colour filters you have available? WE: People like being able to customize their games, that’s been proven over and over. Color displays in these Classic Bally/Stern games completely change the look of the games. It updates them to something fresh & new. Some people still have reservations on deviating from the standard plasma color, but once you convert one game to a different color and see how great it looks, it becomes addicting to try different colors in more games. In short, the white digits have been a huge hit! CD: You seem to have covered all the bases in the Bally/Stern display world, offering kits to convert original displays, and now, offering all-in-one kits. Is there anything left for you to tinker with in the Bally/Stern display realm? WE: There’s a few things related to, but not directly involving, the display boards that I might work on at some point. As for the displays themselves, I can’t be happier. TWO display designs that each offer something uniquely different and live up to my own expectations of what a quality display should look and function like. Now the fun part – shipping out the DIY kits or assembled displays and hearing feedback and excitement from people as they see, in person, how great the new displays make their games look. Customer feedback is truly one of the most rewarding parts of creating new products! To this point, I’ve built two Retrofit kits, one TRADITIONAL kit and about ten UNO kits, for myself and for others in my local community. I can almost build these things in my sleep now. Your mileage may vary depending on your skill set, but the learning curve isn’t steep. Once you’re comfortable with Pinitech’s in-depth instructions and the board layout, assembly is a breeze. 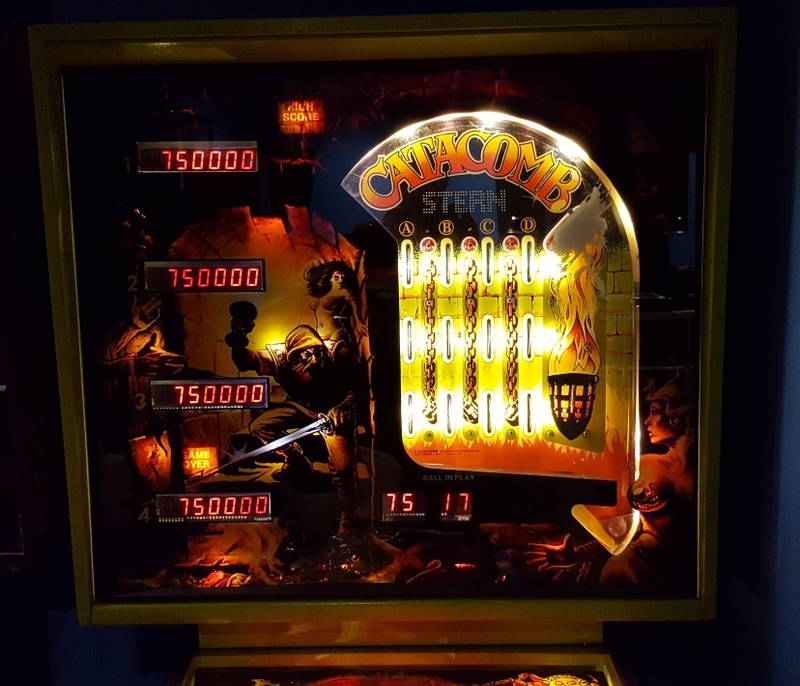 The UNO seems pretty popular in my local community of classic Bally and Stern collectors, and it stands to be seen if my local community is a true representation of the pinball community as a whole. I’ll gladly put my stamp of approval on the UNO kits. The TRADITIONAL kits will work for people who prefer a more traditional look to their boards, or for games that can’t accommodate the mounting space the UNO requires (I believe this will be a problem that rarely occurs, however). I can see these two new all-in-one kits muscling out their kin, the Retrofit, as the price difference between the two is negligible when paired off against the extra time, and skill, needed for the Retrofit conversion. I’ve had experience with both Xpin and Rottendog displays in the past—the Pinitech displays look more native to the game, and their price just can’t be beat. I’m left to hope that Pinitech continues to innovate in the arena of aftermarket technology for classic Bally and Stern games, as well as beyond into other eras and manufacturers of classic solid state pinball machines. Categories: Review | Tags: Bally, Catacomb, Classic Stern, DIY, LED, Pinball, Pinitech, Replacement Displays, Stern, UNO | Permalink. If you are a collector of Bally /Stern games from the 80s, chances are you’ve encountered some displays with “bad glass”, wherein the digits or segments of the digits inside the glass tube no longer function properly. Perhaps a portion of the digit won’t fully light up. Perhaps it won’t light at all. Such issues could be attributed to bad components on the display’s circuit board, but if you are suffering from bad glass/out-gassing, you’ll know it. Short of finding replacement glass, it renders the entire display, including its accompanying circuit board, useless. More often than not, you’d need to track down a single working display, or just give in and replace the whole set with an LED aftermarket solution costing upwards of $200USD. Collect enough Bally/Stern games and you’re bound to end up with a handful of non-functioning displays with burnt out glass. Now, thanks to Pinitech’s Retrofit Conversion LED Display Kit, you can use these out-gassed displays to manufacture a set of fully functioning, lower-voltage LED displays. The Retrofit kit contains a new display circuit board and LED digits to replace the glass tube, and a variety of electrical components that need to be substituted for components on the original Bally/Stern circuit board. This kit is a DIY solution, and does require some skill at soldering and de-soldering circuit board components. If you haven’t already figured it out, this isn’t a solution for everyone. First, you need to have a set of out-gassed donor displays on hand. A novice collector probably won’t have an entire set kicking around, so there would be the extra expense (and bother) of finding and buying a set of dead displays to use in conjunction with the Retrofit kit. And second, you’re going to need the time, skill and proper tools to perform the conversion. Those looking for a plug and play solution need to look elsewhere. There are plenty of aftermarket plug and play options available (both Rottendog and XPin have 6- and 7-digit display sets available). For those looking to recycle their electronic waste and don’t mind getting their hands dirty performing the conversion, the Retrofit results in a great looking display at a price that can’t be beat. Not only does Pinitech help the pinball community by offering products designed to keep our games running efficiently, Mr. Eggert is also a Pinside mainstay, posting as “acebathound”, and can frequently be found patrolling the tech help threads, offering solutions and suggestions to collectors with malfunctioning machines. For those games with an odd-number of displays, like Six Million Dollar Man with six score displays or Elektra with an extra bonus units display, Pinitech will sell individual display kits to supplement the above complete packages. As you can see from the pricing structure, using the existing display PCB from an out-gassed display, and building the kit on your own results in quite the savings compared to other options on the market. Other display options check in at about twice the price. Rottendog offers 6- and 7-digit amber display sets, which come fully assembled and are plug and play, and are $199USD, while XPin’s sells their amber displays individually, also plug and play, and are $54.95USD each (that’s $274.75USD for an entire set). Wolffpac Technologies offers a similar DIY display kit, requiring no donor display, and will set you back $144.95USD for a 6-digit amber set that you will have to assemble yourself. If you have a set of dead displays lying around, the Retrofit solution is a no-brainer. Not only is it the most affordable option on the market, you can customize the colour of the displays to suit your game without breaking the bank. A colour upgrade isn’t available for the Rottendog set. You’ll pay $20USD more per display (or, $100 more per set) to get the XPin colour option, which ships with red, green and blue gels to add colour to the base white display. The displays come with a set of detailed instructions–and it is my opinion, that even the most novice of PCB tinkerers won’t have a problem making the conversion. The first thing I did when setting into the conversion process is to remove pin #1 on the header pins of each individual displays. This step is so important, it is mentioned about a dozen times throughout the written instructions. Pin #1 sends high voltage to the display, which is no longer needed with the low voltage LED conversion. I didn’t chance cutting the pin off, I de-soldered the pin and pulled it out completely on the entire set of displays before I even began. You have a couple of ways of replacing some of the PCB components for the conversion: removing them completely and installing the new component, or installing them in parallel, which will basically piggyback the new component onto the old component on the solder side of the board. I would recommend the former of the two options, as it gives the project a much cleaner look overall and allows less margin for error. I used a Hakko 808 desoldering tool (now being sold as the Hakko FR-300 Desoldering Tool) to completely remove old components from the board, and then soldered in the new with a temperature controlled soldering iron. The de-soldering tool isn’t a must, but it nearly guarantees a clean pull of all the old solder, freeing up the old components and preventing the chance of pulling or breaking traces. You’ll be removing more than sixty points of solder for just one display, so having a de-soldering tool in your toolbox is a sound $200USD investment if you don’t have one already. In total, for each board, you are replacing 7 or 8 transistors, and four sets of 6, 7 or 8 resistors, depending on if the display is six- or seven-digits. I was methodical in my approach, and removed one set of resistors from my board, and installed the new components before moving onto another set. Otherwise, I thought it would get pretty confusing keeping track of a bunch of empty resistor holes and following the Pinitech cheat sheet of what goes where. The placement of the resistors on the board is somewhat logical, but in some cases, like in any PCB board design, the component is placed where it fits to minimize space, and not where it should logically be placed. To make things even more interesting, Bally and Stern had many revisions of the display board throughout the ten year run of their classic games, so depending on which version of display you have, the parts that need to be replaced will be in different positions on the board. The community has accounted for this, and the Pinside thread dedicated to the Retrofit displays has identified the majority of the different board revisions, giving the DIY-er a visual cheat sheet to identify which components need to be replaced. The points of contact for the old glass need to be removed from the component board completely, or need to be cut close to the old glass so the old metal tab connectors can be affixed to the new upright display board. To the new upright display board that will replace the glass, you’ll need to attach the LED digits, which have eight contact points per digit that need to be soldered. Once the two boards are affixed together using the provided brackets, you can solder the metal tab connectors to the display board or use the new angle connectors provided if your original tabs were manged or missing. The angle connectors provide a cleaner look overall, but it requires a bit more effort to install. To finish up, you’ll need to choose a way to jumper the 5V line to the high voltage line. Again there are a number of ways to do this, but each involves a jumper wire from one point of contact to another on the solder side of the display PCB. This step is the only time in the whole process that the conversion would appear to be “hackish”. None of the points of contact are near each other, so the user will just have to pick one that they think looks the least invasive. The instructions outline how to test the display on the bench using a 5V power supply, or, if you are feeling brave, and have triple checked your work, you can install it into your machine and watch the cool lights of the LED display its segmented numbers. If for some reason segments don’t light, the guide will help you troubleshoot the problem. I had two digits that refused to light on one display, which ended up being a couple of bad digit drivers. Luckily, Pinitech has accounted for these bad components (they are ones that are not replaced in the conversion) and includes a small number of extra 2N5401 transistors as backup. Credit Dot: When did you first discover that the Retrofit kit would be something that could be successful in the market? CD: How long did the research and development portion of the Retrofit project take? CD: The circuit boards attached to the display glass on the original Bally/Stern displays came to market with many different designs over the years. Was there difficulty accounting for all of the different configurations of boards out there? CD: What unique elements of the original Bally/Stern design allowed the conversion to be possible? WE: “Since the old display driver circuits used many resistors and transistors, it made it easy to swap those components out for different values. For instance, if I couldn’t swap transistors for mosfets, the 4543 would have been over-driven on its outputs. Had the drivers been dedicated ICs unique to plasma displays, the conversion may not have been possible at all. CD: The converted displays tap into the 5V power supply, bypassing the high voltage needed to power the original displays. Do the converted Retrofit displays tax the 5V line in any manner significant enough to impede the machine’s performance? CD: What advantages does the Retrofit kit offer over the other aftermarket display systems available on the market? WE: “The single largest draw is price-point. But I think the idea of using existing boards is also a major advantage. Lots of people had old boards sitting around “for parts” that were collecting dust. This is a way to turn them into something useful again, gain space, save money and create some great looking LED displays! At the time, these conversion kits were also the only budget way of getting WHITE LED displays that could be used with color filters for unlimited color choices–at about one-third the cost of the other option on the market. Many of the products on your site are available in DIY form, where the end user assembles the product themselves. 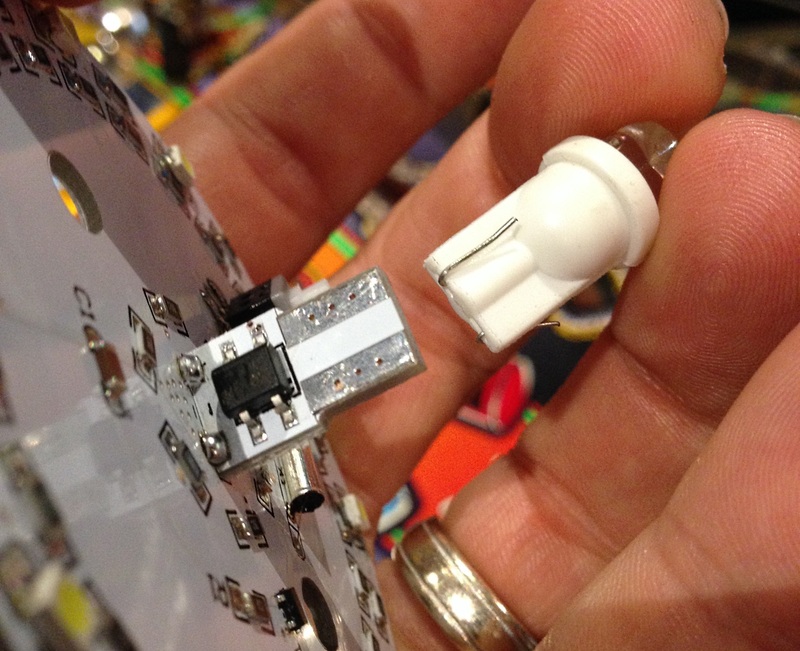 Have you seen an increase in hobbyists wanting DIY kits? As the hobby grows, are you seeing the skill set of the common hobbyist mature? “I think the interest is growing in DIY kits. It’ll never be on-par with plug-and-play, but having kits available like this with clear instructions that allow someone to assemble without frustration the first time helps grow the demand for DIY options. When things are frustrating or unclear it becomes a major deterrent. These conversion kits are definitely on the more difficult end of DIY, but even so, I tried to make them as user-friendly as possible. Your main pinball interest seems to lie in the early solid-state games of Bally and Stern. The majority of your products at Pinitech cater to that era. Does your interest in pinball span all eras of machines? What are some of your favorite Bally/Stern titles? “Funny you say that. I often think about how anyone that is checking out products I sell, at least up until this point, is definitely going to think I’m only into Classic Bally/Stern machines. I actually enjoy most games from the early 80’s to present day releases. Anything with better sound and more complicated rule sets, than the very early solid state games, I enjoy. I’m definitely a big fan of Data East, Williams System 11 & WPC. I’ve done more with diagnostic tools for Bally/Stern because I started out with those machines early-on in the hobby. They’ve always been more affordable, and there’s a lot of neat titles and artwork in that era of games. They’re very approachable from an electronics standpoint, too. I’ve performed the conversion on two sets of displays with dead glass–a six-digit conversion for a Stern Stars and a seven-digit conversion for a Stern Star Gazer. If focused, and I kept to the task, I could have one display converted in about thirty minutes. Overall, I am very happy with how the displays look in the games. The numbers are nice and robust, and are crisp and bright without being blinding and looking out of place. I went with blue displays for both Stars and Star Gazer–they were the most affordable, and fit the overall colour scheme of both titles. The Stars came with four dead displays out of the five, while the Star Gazer came with no displays at all, but I was able to find someone to sell me a set of dead 7-digit displays for $20. Would I convert a set of displays for the sake of converting to low-voltage LED if the displays worked properly? Absolutely not, but it is a nice option to have when a set of displays with bad glass presents itself. The final product is robust and professional looking, especially considering it is a DIY project that uses original parts from the 1980s. This project is extremely affordable, compared to the other options on the market, and further, it feels good to take something that would otherwise be junk and put it back into service. Categories: Review | Tags: Bally, DIY, LED, Pinball, Pinitech, Replacement Displays, Retrofit, Star Gazer, Stars, Stern Electronics | Permalink. The games produced by Bally and Stern between the years of 1977 and 1984 were enormously popular with players when they first graced the arcades, and remain popular to this day. Soaring prices of New-In-Box games and classic 90’s era Williams titles have driven collectors, who may not have enjoyed these games when they were first on route in arcades, to discover and enjoy them in their own game rooms. Perhaps collectors are finding that the Value:Fun ratio is more balanced in a Bally/Stern game than it is in more contemporary offerings. 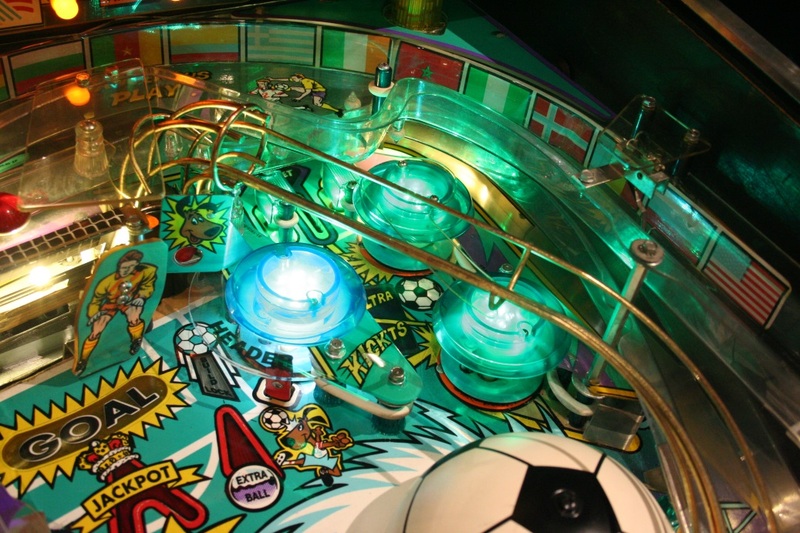 The continued popularity of the Bally/Stern subset of games also points towards the acceptance of a more “no frills”-type of pinball: no deep rule sets, no complicated mechanisms or toys, no ramps or multi-level playfields. The games offer the player a wild dash to the finish, rather than the long exhausting marathon sometimes offered by the more modern pinball machine. Given the sheer number of games originally produced during the 1977 to 1984 run, the survival rate is very high and there is a great demand for reproduction parts to keep these games running properly. This is a first review in a continuing series where Credit Dot will examine some of the reproduction parts being manufactured and how technological innovation is making Bally/Stern games look and play better than ever. I’ll state at the outset that I’m not a huge fan of LEDs in games made prior to 1986. It’s an arbitrary date I’ve set for myself that coincides with Williams offering its first game powered by the System 11 operating system (High Speed in January of 1986). For all Electromechanical and early Solid State games, I’m a firm believer that the warm glow of incandescent bulbs is the only way to go. There’s no accounting for taste, however, and modifying a game in your collection to your personal tastes is half the fun of ownership. As you may or may not know, Bally and Stern games between 1977 and 1984 cannot properly accommodate LED bulbs: the controlled inserts will offer a seizure inducing flicker if LEDs are added to a game without first making suitable modifications. The LED bulbs draw so little current that the controlled lamps (any lamp that is turned on and off by the MPU) fail to “latch on”, resulting in the game attempting to turn on the lamp every fraction of a second until the signal is turned off. Resistance must be added to the game in order for the LEDs to function properly, and allow the lamps to latch on. There’s a few ways to go about doing this. The first option is to solder a resistor to each MPU-controlled bulb socket. It’s the cheapest way to go about the process, as a single resistor will only cost you $0.05, however, there’s a lot of soldering involved and it’s a pretty invasive process–having to permanently solder a 470 ohm resistor to each socket. Another option is to buy an adapter kit from Siegecraft Electronics to add to your game. The kit retails for $45.00USD, and can be found at the Siegecraft webstore or Pinball Life (both sites are out of stock at time of writing). Essentially, the kit gives you three small circuit boards with resistors mounted on them that plug into your original lamp driver board in the backbox. Instead of the resistors being mounted to the sockets themselves (as in our first example), multiple resistors are mounted onto the three daughter boards. The contents of a Siegecraft LED Adapter Kit. The final option is to obtain an entirely new lamp driver board with the resistors incorporated in the design of the board itself. 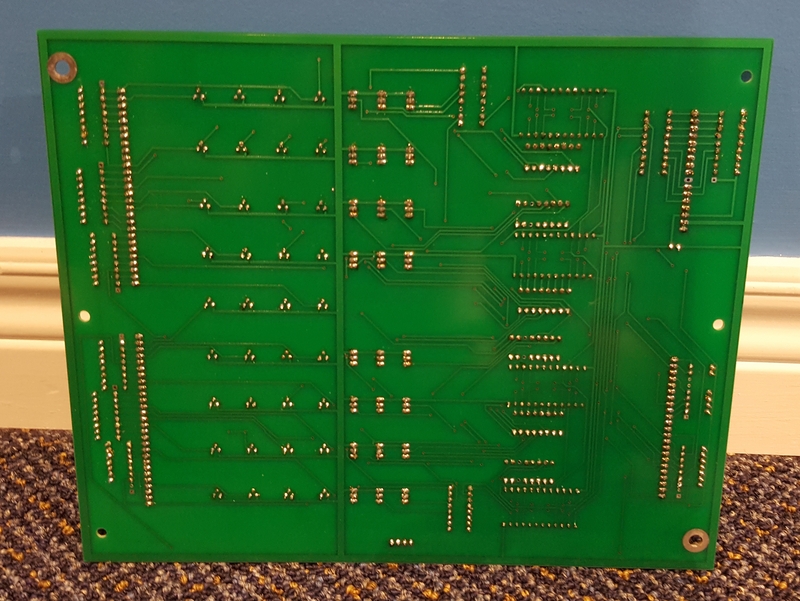 Alltek Systems, makers of fine reproduction circuit board solutions for Bally/Stern games, have incorporated an “LED Flicker Free” feature into their lamp boards that will eliminate the LED flicker completely. The Alltek board will set you back around $119.00USD. However, buying the entire board would be overkill for most people. The original Bally/Stern lamp board is perhaps the easiest board in all of pinball to troubleshoot and repair. The layout is straightforward and easy to follow from input signal to output signal, and there aren’t many wild card components to confuse those new to pinball repair. Most times, it’s going to be a bad transistor component or connector issue that prevents a lamp from working properly. I had a situation where I had acquired a classic Stern game that was completely missing the lamp board, so I was in the market for a board, whether or not I was going to put LEDs into it. There are plenty of refurbished boards available for sale on Pinside, for around $50USD, from reputable sellers. I was going to go this route, however, I found that Pinball Electronics (also known as NVram.weebly.com), a webstore maintained by Pinside user “barakandl”, had made available for purchase his own design of a Bally/Stern lamp driver board. 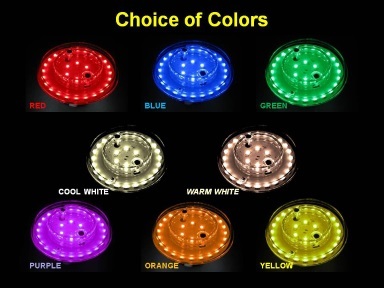 His board retails for $90USD (including shipping) and includes all the LED capabilities of the Alltek board for $30USD less than the more established brand. Further to this, Pinball Electronics will sell the bare printed circuit board, with no components soldered to it, for a mere $15USD, and allow you to do the soldering work yourself. 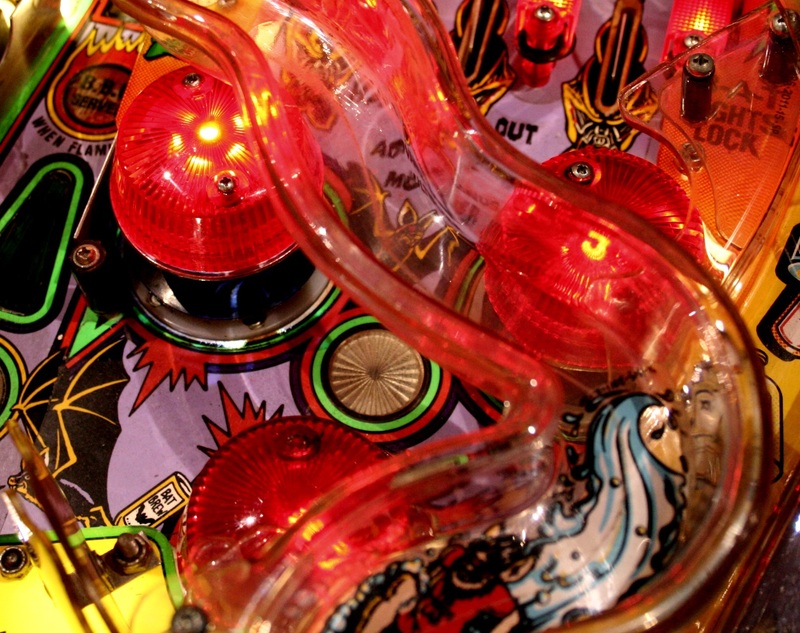 With an influx of collectors and players entering the pinball hobby, perhaps there are a greater number of people diving into PCB repair feet first, without knowing the basics (or having a practical understanding of what they are doing). Being able to assemble a relatively simple PCB from scratch not only helps beginners learn the basics of soldering, but it will help build confidence and comfort in working with PCBs when the next repair is needed. For those with a more advanced skill set, it appears that building the board from scratch, and doing the tedious soldering yourself, will offer a lamp board solution that will be very friendly to your pocketbook. Further, the footprints for the four 4514 chips have been designed to accommodate both the original DIP-24 4514 chips (marked as obsolete but still available), or the more readily available, and cheaper, SO-24 (small outline) 4514 chips. As you can tell from my bottom line total above, there is value in building the board yourself. It checks in at nearly half the price of an Alltek lamp board, and is just a few dollars more than the kit offered by Siegecraft, while offering the same functionality and LED support as both options. If you are willing to shop around for the alternate parts, you may be able to shave a few dollars more from my total above. I opted to use discrete, individual resistors in my build, rather than using the resistor array packages. No difference in function in the end, just a few more points to solder. Assembling the board is as straightforward as can be. Pinball Electronics offers a bare bones data sheet as to where each component needs to be soldered. For those who are not adept at DIY board population, a temperature controlled solder station, like the Hakko FX888, with a fine tip isn’t completely necessary to complete the job here, but it will ensure a clean looking and fully functioning end product. I had my board fully assembled and installed in my machine in about an hour and fifteen minutes. The board worked “right out of the box”, as it were, as I had re-pinned all of my connectors as a preventative measure while restoring the game (I implore beginners, please take the time to learn how to use a Molex crimping tool and re-pin your connectors before trying to locate bad components on your boards–I don’t know how many times I’ve read “It ended up being a connector issue” in Bally/Stern repair threads). To finish the installation, the board needs to be attached to the switched illumination bus (found at one of the controlled lamps sockets on the swing-out wooden back board). All of the aftermarket replacement solutions discussed above need this modification for proper operation. The Siegecraft kit needs each of the mini-boards to be connected to the bus, resulting in a three wire menagerie running to the backboard. The Alltek and the Pinball Electronics boards have built-in terminals ready for the user to tap into. In the case of the Pinball Electronics board I built, a four-terminal Molex plug can be used to attach the wire to the board, as four 0.1 male pins, in parallel, have been integrated into the design of the board. This provides an overall cleaner look using parts correct to the period, and appearing less “hack”-like. 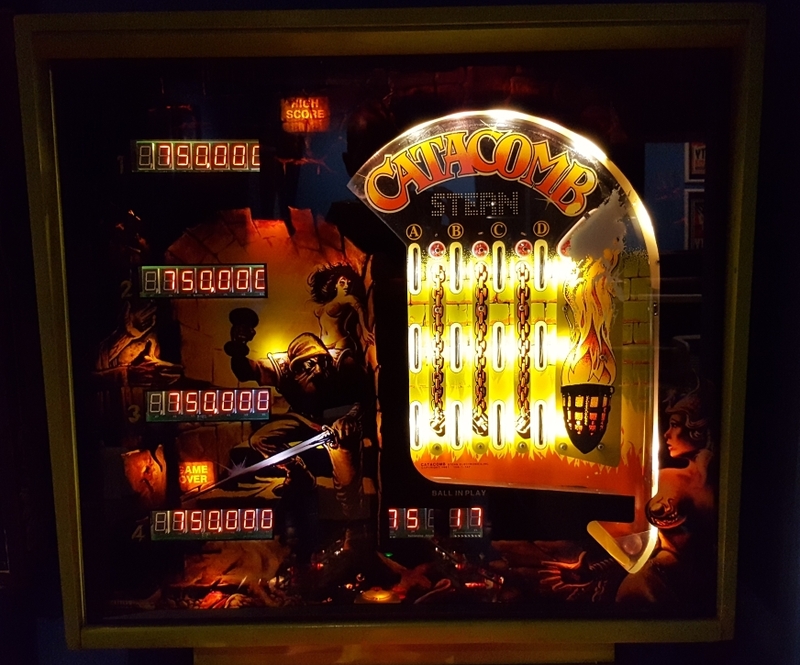 The Pinball Electronics lamp board is a quality product at a fantastic price point given the other options available on the market. If you want to add LEDs to your Bally/Stern game, the board offers a sleek look with the LED option built right in at a price point that can’t be beat. If you don’t mind a little manual soldering labour and assemble it yourself, it offers a value that can’t be matched. Categories: Review, Uncategorized | Tags: Bally, DIY, LED, Pinball, Pinball Electronics, Reproduction Parts, Stern Electronics | Permalink. Part One, featuring BriteMods, can be found here. Part Two, featuring Comet Pinball, can be found here. I don’t think there is a clear cut, flat out winner in the Pop Bumper Showdown. Like Art from Comet Pinball is known to say: it all comes down to personal preference. Different games call for different lighting solutions. Pin*Bot will be keeping a set of Comet’s 6LED Crystal Fans installed, paired with a set of Dennis Nordman’s sparkly pop bumper “thingies” (see below). The Comet fan offers a more traditional feel–the upper bagatelle playfield that lies atop the Pin*Bot pop bumper nest calls for a less harsh lighting option than the SMD rings and discs provide. As far as non-traditional pop bumper options go, I would recommend either Comet’s Pop Bumper Rings or BriteMods’ BriteCaps EVO. Both look fantastic installed, and both light the playfield beneath the pop bumpers (by way of bottom mounted SMD lights) which is a major selling point for both of these lighting options. The interactive flashing of the centre SMDs on the EVO is a nice touch, but in itself does not make the EVO a clear cut winner. 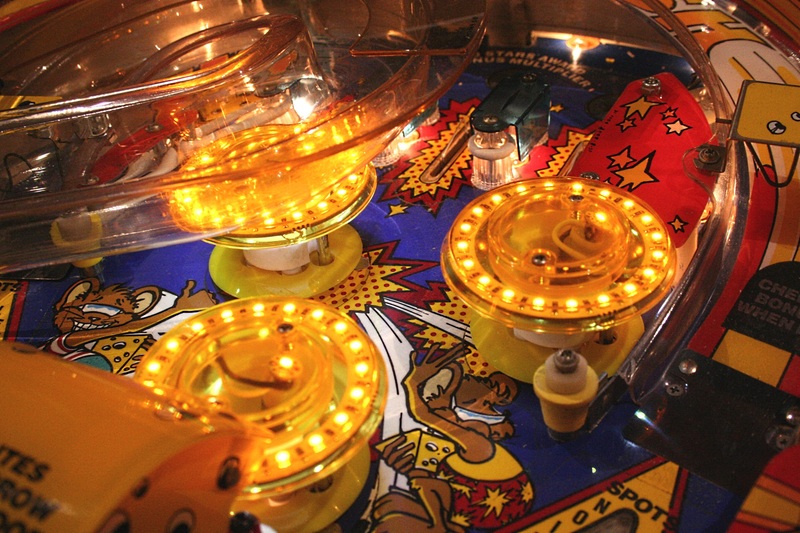 The Comet rings just look darn cool and really pop, so much so that pinheads and non-pinheads alike have been marveling at the rings installed in my Mousin’ Around (its yellow pops are smack dab in the centre of the playfield and are now bright and bold thanks to the Comet touch). The Comet rings, however, may have a few points deducted because of installation issues (I had one short out on me, thanks to user error in test). The BriteCaps EVO lose points for the possibility of fit issues in areas with tight clearance, an issue I ran into on Pin*Bot during test. When all is said, the price really sets these options apart. If you want a great looking non-traditional lighting option at a great value, choose the Comet rings; if you want a total light experience with build quality akin to a Sherman tank and money is not a factor, go with the EVO. A clear cut winner is difficult to choose, given that, in the end, one man’s eye candy is another man’s eyesore. All of the games that I used on test had pop bumpers with static lighting. Pin*Bot, Rollergames, Mousin’ Around and World Cup Soccer ’94 have pop lighting that is either on or off without the aid of computer controls. I attempted to test all of the available options in Funhouse, which has computer controlled lighting, and it was an utter failure. All of the options suffered from ghosting and leakage. The small amount of voltage present in the line which is burnt off by the incandescent without lighting the bulb is actually enough to fully light the lower voltage LED/SMDs. The newer technology doesn’t contain enough resistance to eat up that lingering voltage. In Funhouse, the SMD rings and discs were lit when they were not supposed to be, and even when one pop bumper was trying to behave normally, it still flickered and ghosted something awful. An LED OCD board would do the trick here, however, a two hundred dollar solution to a ten dollar problem isn’t something I’m willing to consider. I’ll stick with incandescent bulbs in the Funhouse pops for the time being. This should serve as a word of warning to those wanting to mod games with computer-lit bumpers (it’s mostly Lawlor games, lets be honest). The name itself is ridiculous: “Nordman’s Sparkly Pop Bumper Enhancement Thingy”, but it really does wonders in a pop bumper. I used them to bolster the look of Comet’s traditional LED choices in Part 2 of the review with fantastic results. 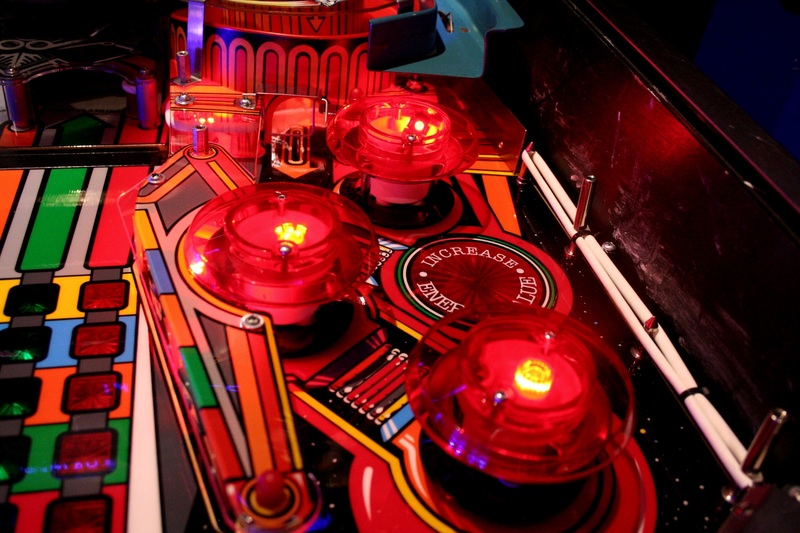 It’ll come as no surprise from the name, that the little plastic disc was designed by famed pinball designer Dennis Nordman. The beauty of the design is in its simplicity. The plastic nests into the pop bumper body, and its sparkly design does a good job catching and reflecting light. Furthermore, it covers up the ugly guts of the pop bumper giving it a more clean look overall. The discs work great with a traditional 555 incandescent bulbs but really stand out when using a Comet bulb that directs light, such as the 6SMD Crystal Fan. It is a winning combination. The design is simple, and to be honest, can be easily replicated in your home workshop with a piece of Lexan and a roll of foil gift wrap. For those less inclined, the discs are available through Pinball Life for $2.95USD per “thingy” and are well worth the money…even though spending nearly ten bucks for a set of three pieces of plastic sounds kind of ridiculous! Conspicuous by their absence in the Showdown were products from CoinTaker, but I’d like to give them some attention here in the wrap up. Their pop bumper-specific product is called the Afterburner, a disc-like lighting option akin to Comet’s disc. I was not able to do a full scale review of the Afterburner, as the products I bought for test, to be frank, blew up. I installed a red Afterburner in Pin*Bot as I did with the other lighting options, and when I gave the machine power, a loud pop was heard followed by smoke and that concerning smell of burnt plastic components. I feared the worst, obviously. Taking out the Afterburner, I noticed one of the components on the Afterburner was completely obliterated. I replaced the Afterburner with a Comet LED and (thankfully) there appeared to be no permanent damage to the game itself, however, the Afterburner was toast. I thought user error might have played a part, or even faulty wiring in my game, so I tried to install the remaining two Afterburners in both Rollergames and Elvira and the Party Monsters. However, the same meltdown results occurred to the Afterburner, which points to an error in the CoinTaker design, or a bad batch of components. I have emailed CoinTaker about the issue, but as of writing, I have received no response, explanation or replacement. I was informed that the red Afterburners used in the Pin*Bot test were a newer version of the product which boasted non-ghosting technology. I tested out an older version of the Afterburner in white, apparently without the non-ghosting technology, in my World Cup Soccer ’94, and it lit up just fine. I’m awaiting CoinTaker’s final word on why a set of their Afterburners went up in smoke in three different games of mine. The look of the Afterburner, once I got it lit in the WCS94, is very similar to that of Comet’s 11-SMD disc. Both products carry the same lighting pattern and come in a similar color palate, but the main difference is that Comet’s disc can have its brightness adjusted via an adjustment screw, whereas the CoinTaker Afterburner cannot. The price really sets the products apart: the Afterburner is $4.99USD for white but if you want colour you’ll have to pay $1.00 more (!) while the Comet disc is $4.95USD each across the board. The brightness adjustment feature and value give Comet the upper hand over the Afterburner. CoinTaker also carries a pop bumper light that I was not able to test, which contains four side SMDs and one on top. I was able to test the forerunner to that 4/1SMD, which is essentially the same lighting layout, except using LED technology. I tried to locate this product on the CoinTaker’s new website, but could not. I did, however, find the product here on the old CoinTaker website. The 4 perimeter LEDs actually did a good job lighting up the pop bumpers without being too harsh on the eyes, allowing the bulb to be a viable alternative to anything sold by Comet. Check the picture below where the two right pops contain the CoinTaker4/1LED in green and bathe the area in a nice green hue. I cannot speak to the SMD version of the bulb, but both the SMD and the LED versions have a price comparable to that of Comet’s “Crystal Fan” option. Left pop bumper contains a warm white CoinTaker Afterburner, the right two contain a CoinTaker 4/1 LED. As you can see, my attempt at reviewing CoinTaker products kind of fell flat and was an overall disappointing showing from a traditionally cutting-edge leader in the hobby. I don’t base that statement solely on the faulty products I received from the company, either. For a long time, CoinTaker was the only lighting game in town, their name synonymous with pinball lighting alternatives. CoinTaker LED kits used to be the gold standard in modding and was major selling feature for games that had them installed. 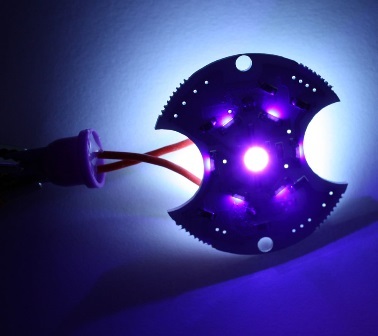 However, with the emergence of Comet LED, BriteMods and other pinball lighting companies, it appears to me that CoinTaker has not stepped up their game to match or exceed the ingenuity, value and choice being offered in a cutthroat lighting market. To end on a positive note, the random winners of the BriteMods contest are Katie C. and Stephen L. Katie C will receive a set of BriteMods BriteCaps EVO and a set of BriteMods BriteButtons. Stephen L will get a set of BriteMods BriteButtons. 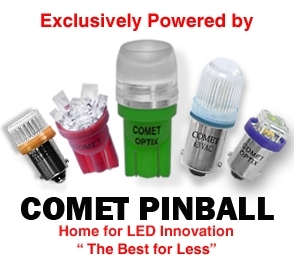 The winners of the Comet Pinball contest are Josiah C. and Tony L. Both winners will receive a prize pack including some of Comet’s pop bumper lighting solutions as well as other Comet goodies. Thanks to the great people over at BriteMods and Comet Pinball for their generous donation of prizes! Thanks to all who emailed in—the response was overwhelming. I guess everyone loves free stuff! Categories: Review | Tags: BriteMods, CoinTaker, Comet Pinball, Dennis Nordman, Funhouse, Mousin' Around, Pinball, Pop Bumpers, Rollergames, World Cup Soccer '94 | Permalink. Ah, the pop bumper. The ultimate ball randomizer. It was once the centerpiece of nearly every pinball table, but as technology changed and playfield layouts became more complex, the pop bumpers became somewhat of an intrusion, leftovers from a bygone era, and were tucked away in dark corners and hidden under elaborate ramps. Take Williams Demolition Man, for example. Not only was one pop bumper assembly completely removed from the layout, you’d be actually hard pressed to notice they exist at all, blocked from view by a series of ramps, wire forms and plastics. This is a far cry from the days when bumpers all but dominated the woodrail era games. Ask any pinball aficionado, though, and they’ll tell you that it ain’t a pinball machine unless there are pop bumpers on it! As the bumpers themselves moved to the periphery, it became obvious that the single light contained within the assembly itself wasn’t enough to draw attention to the unit. Faceted caps were employed in some instances, as in many modern Stern games, or covered up completely with molded plastics, as they were in Data East’s Simpsons and Williams’ White Water. 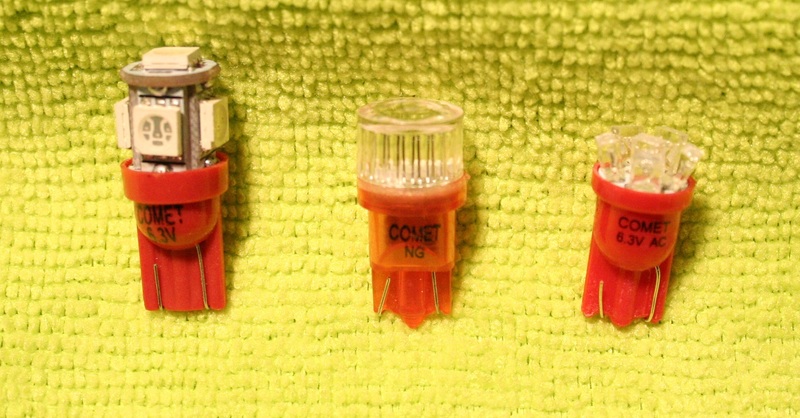 However, for the most part, pinball companies old and new have resisted perfecting new lighting techniques for the pop bumper, and have stuck with the same old single bulb in a single socket. The recent surge in enthusiasm for LED lighting has allowed aftermarket companies to offer up solutions for the tired looking, and somewhat forgotten, pop bumpers. 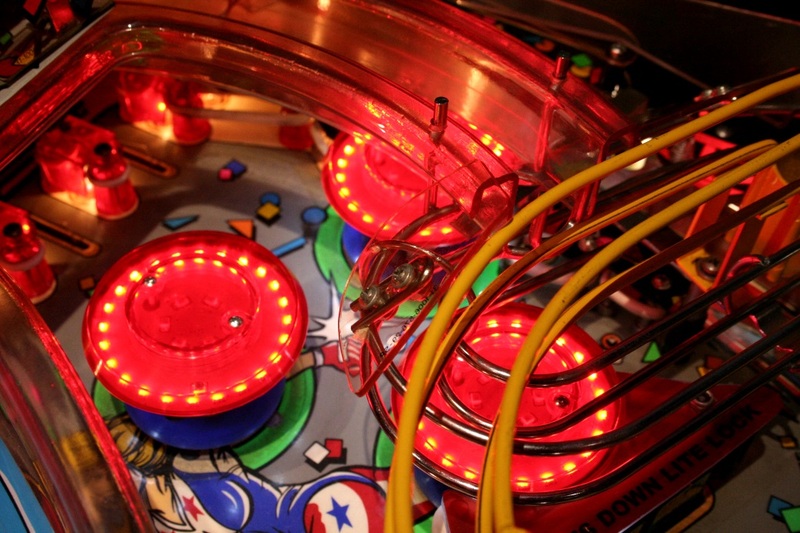 Love them or hate them, LEDs are common place in today’s pinball landscape. So much, that every game that leaves Stern Pinball’s factory now comes with a full compliment of LEDs. To move your old game into the 21st century, you could just remove the carbonized 555 incandescent that currently sits inside your pop bumper and replace it with one of countless LED designs on the market. 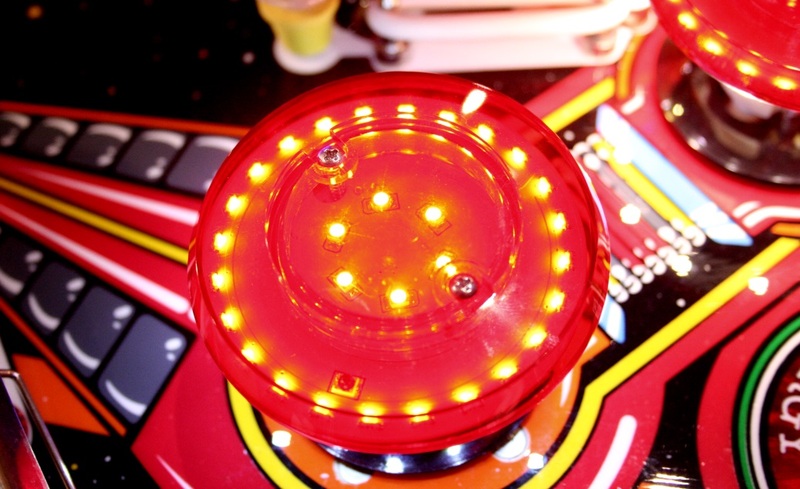 However, the minds at aftermarket lighting companies in the pinball landscape have dreamt up other designs that take lighting the pop bumper cap to the next level. In the next week or so, I’m going to try and wade through the sometimes confusing world of pop bumper lighting options, and weigh the pros and drawbacks of each solution. I’ve rounded up pop bumper lighting solutions from three of the biggest names in the hobby—Comet Pinball, CoinTaker and BriteMods—in an attempt to explore the different options out there. If you are a staunch supporter of incandescent bulbs, this series may not be for you. If you constantly strive to make your machine look its best, brightest and most colourful, I’ll try my best to help you make your pop bumpers really…um, pop. When in doubt, start with the most expensive option, right? All kidding aside, BriteMods’ BriteCaps EVO pop bumper light has to be considered a front runner in the race to light your pops. It isn’t just a lightbulb, it’s an entire lighting solution. Available exclusively from go-to parts supplier Pinball Life, the BriteCaps EVO (which stands for Enhanced Visual Output) provides a visually pleasing experience while giving customers bang for their buck in extra features not available from the other aftermarket lighting companies. The BriteCaps EVO was born from BriteMods’ first foray into pop bumper lighting: the original BriteCap. 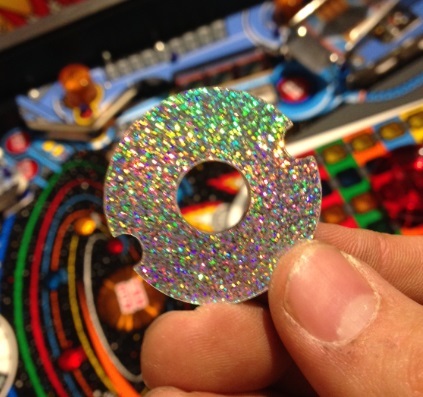 The original design, which is still available from Pinball Life, was a unit consisting of 31-Surface Mounted Diode (SMD) lights mounted to both the top and bottom sides of a ring set inside a pop bumper cap. Since the unit came “pre-capped”, the end-user removed their old pop bumper cap and simply installed the new one with the BriteCap pre-installed in it. The BriteCap EVO takes the cap out of the equation and ups the LED count to an astounding 40 points of light: 24 SMDs on the topside available in a wide array of colours, 10 white SMDs on the bottom to illuminate the playfield, and 6 center SMDs that can be adjusted (via a switch) to always be on, or to react to the vibrations of the pop bumper. Your original pop bumper cap is used in the EVO application. Each BriteCaps EVO unit comes individually boxed. Inside the box, you get the BriteCaps EVO itself, a set of installation instructions and two pop bumper screws that are longer than the traditional ones to account for the extra height the BriteCaps EVO adds to the bumper. The BriteCaps EVO is a single unit—it’s built like a tank—and has no wires or other external hangings. The unit has a brightness adjustment dial, that can be manipulated with a Phillips screwdriver to set the brightness to your liking. Pinball Life gives you the option of adding on pop bumper caps to your BriteCaps EVO order, but from what I can see, they are just standard Williams/Bally caps that are offered. The BriteCaps EVO experience isn’t a cheap one. Each EVO unit will set you back $12.95USD. That puts a set of three at $38.85USD. It still comes in cheaper than its predecessor the original BriteCap, which retails for $14.95USD each for a standard cap, and $16.95USD for a jeweled cap. The BriteCaps EVO brand comes in red, blue, green, purple, orange, yellow, warm white and cool white. Note that this colour choice is for the 30 lights on the top of the EVO only, the bottom ten lights are white across all colour choices. The EVO will work in any Williams/Bally, Stern, Sega or Data East game that uses a standard pop bumper body. Standard, unfaceted, unjewelled caps seem to be suggested (and encouraged) by BriteMods and Pinball Life, as they are offered as an add-on to your EVO order. The unit itself is pretty much plug and play. With the machine off, remove the bumper cap and 555 bulb, choose your Flash React™ setting via the switch on the bottom of the unit, carefully insert the EVO into the bumper socket, and reattach the cap with the two screws provided. I really like the construction of the EVO unit. The base that plugs into the socket has incredible substance. The most frustrating part of LEDing a game is dealing with those little wire connections on the plastic stem of the bulb assembly. They need to be wiggled, adjusted and bent in a very particular way so that a solid connection is made with the socket. Hoping that connection is sustained, and doesn’t mis-align during normal game play, is a worry as well. The EVO design completely eliminates all this fiddling around. The connection point plugs into the pop bumper socket with ease and gives a robust connection on the first attempt. Base connection points of the EVO versus the standard 555 LED/SMD bulb. The side-fire positioning of the top SMDs make for a visually pleasing experience. The theory behind the side-fire mounting is that the light is directed outwards, rather than directly up toward the player. This achieves maximum light throw without burning the retinas of the player. I was able to colour match red EVOs to the red pop bumpers in both Williams Pin*Bot and Rollergames. I prefer the look of matching the colour of the EVO to the bumper cap, rather than letting the colour of the bumper cap do all the work with a white light beneath it. The latter gives a washed out feeling, while colour matching gives a much more full and rich result (as it does when colour matching an LED with a playfield insert). The picture below of the EVOs installed in Pin*Bot may not illustrate this completely, but the middle bumper with red EVO emits a far truer red than the bottom bumper does with its warm white EVO. The BriteMods website suggests that the user may also consider replacing coloured bumper caps with clear ones, giving the chosen colour of EVO a clean palate to work with. I swapped in a clear cap momentarily for the test in Pin*Bot, but it was not a look I was fond of. The light was much too harsh on the eyes and less visually pleasing than colour matching with a red cap. Admittedly, my eyes have a hard time processing LED/SMD lighting, and when I wear my glasses to play, it just gets worse. I installed the red BriteCaps EVO with a red pop bumper cap on full brightness on both Pin*Bot and Rollergames, and never had an issue with the light being harsh or distracting (we can thank colour matching the cap with the SMD and the side-firing for that, I believe). Pin*Bot Application: Top bumper contains a standard 555 incandescent, middle bumper contains a red EVO with Flash React enabled, bottom bumper contains a warm white EVO with Flash React disabled. The 10 bottom white SMDs do a great job of completely lighting up the pop bumper area. 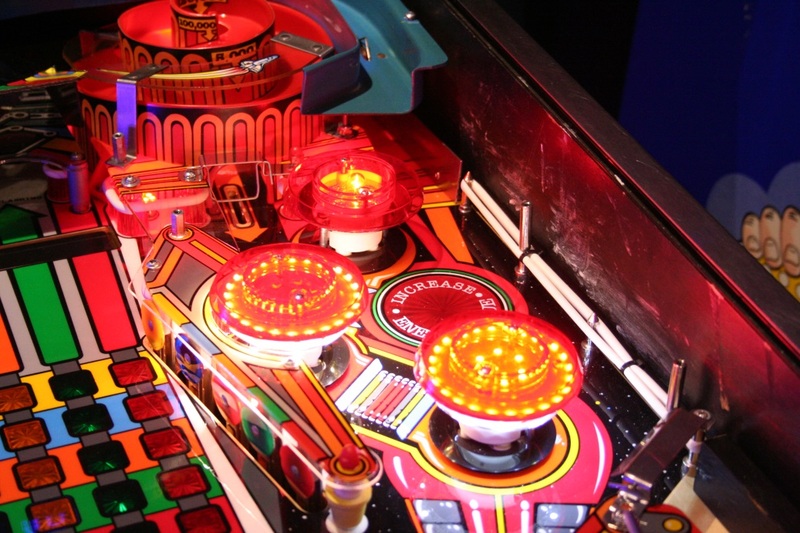 The results were stellar in Rollergames, a pinball machine notorious for leaving the rear half of the playfield ill-lit and hidden under black plastic coverings. The light cast by the bottom SMDs work to illuminate the once gloomy area and in doing so bring to life the art around it. It also worked to brighten up the playfield area beneath the mini-playfield on Pin*Bot, nicely catching the sheen of the freshly clear-coated playfield I had installed. Rollergames application: A set of red EVOs are installed. The photo captures how well the EVOs light up the surroundings, compared to the dim incandescent bulbs near the rollovers. The six center SMD lights, armed with Flash React™ technology, are a neat little bonus you get with the BriteCaps EVO brand. Some may use this interactivity to help justify the expensive sticker price of the unit itself. On the bottom side of the EVO, there is a small toggle button. If left in its original position, it disables the trademarked feature and the six lights stay on with the other 24 top lights. 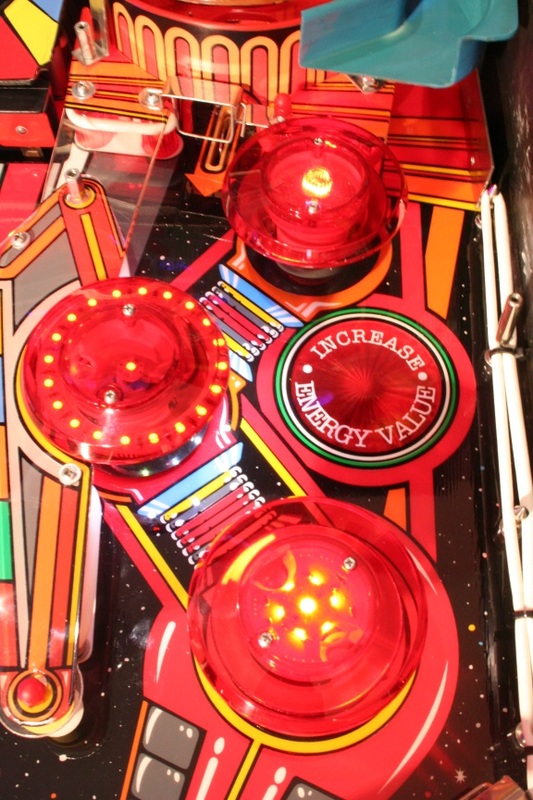 If depressed, the lights will remain off until vibrations from the game (moreover, the pop bumpers) are detected, which will light the six center lights briefly. It makes for a neat light show when the ball gets bouncing around in the pop bumper nest. I would have liked to have seen more than just six of the thirty lights react to pop bumper hits, but I’m sure it walks a fine line—too many would have created unwanted strobe. I can’t help but think that there seems to be missed potential with the technology as it is employed here. However, Flash React™ is not a necessary feature that needed to be included, but makes for a nice interactive, customizable bonus and is a feature that may work to set EVO apart from its competitors. One unavoidable downfall with the EVO is that it adds 5mm in height to your pop bumpers. The circumference of the EVO is just as big as the pop bumper cap itself, meaning the EVO will not nest inside the cap like an original BrightCap ring would have. It’s an unavoidable issue: the inner plastic lip of the pop bumper cap traditionally envelops the outer edge of the pop bumper body, however the EVO sits flush on top of the body, thus, the pop bumper cap may only rest flush on top of the EVO. A word of warning: be ready for frustrating clearance issues and making an endless amount of adjustments for any game with pop bumpers that have ramps, wireforms or mini playfields that rest on top of or near them. On test, Rollergames was able to handle the extra height of the EVO, however, Pin*Bot’s mini-playfield posed fit problems after EVO installation. 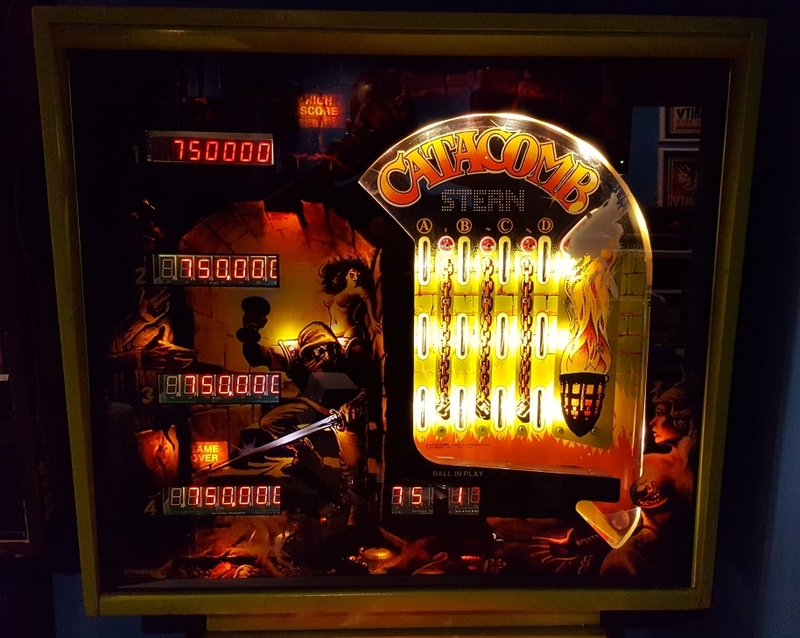 I already had the thicker Classic Playfield Reproductions mini-playfield installed, and those extra 5mm really threw everything out of whack, even creating a ball hang-up on the mini-playfield where there was not one before. As stated above, each EVO is shipped with a set of longer pop bumper screws that take into account the extra height added, which is fantastic forethought, but short of grinding out that inner pop bumper lip with a Dremel, there is a high probability of fit issues in many modern games. BriteMods also warns of using the EVO in games where partially cut bumper caps are necessary (think Addams Family’s single sawed-off cap next to the side ramp). If you can justify spending the money, BriteMods’ BriteCaps EVO provides an excellent lighting solution and a quality product that will make the pop bumpers, and their surroundings, stand out. The build quality of the unit is truly exceptional. The first product reviewed in the series looks to be a front-runner for top of the class. That said, the extra interactivity provided by the Flash React™ is a fun and unique attribute to have, but the result of six small lights reacting in time with the firing of pop bumpers may not be enough for some to consider the feature “value added”. The extra height is a major downfall in an otherwise fantastic product. Fit issues will prevent me from keeping the EVO in my Pin*Bot, but the extra splash of light and colour they add to Rollergames makes for a welcome change to the dull 555 lighting. Check back for Part Two in the series, where CoinTaker’s AfterBurner pop bumper lighting solution is tested and reviewed. Two BriteMods prize packages are up for grabs! The prizes were generously donated by Dan Rosen at BriteMods. The first randomly selected winner will receive a set of three BriteCaps EVO and a set of BriteMods BriteButtons flipper buttons. The second randomly selected winner will receive a set of BriteMods BriteButtons. To enter, simply send an e-mail to creditdotpinball@gmail.com with the word “EVO” in the subject line. One entry per person please. Two winners will be picked at random (using random.org). Contest closes July 1st, 2015 and winners will be announced shortly thereafter. Open to residents of the US and Canada only…I’d love to open it up, I can’t afford to ship stuff overseas! Categories: Review | Tags: BriteCaps, BriteMods, Demolition Man, EVO, Pin*Bot, Pinball, Rollergames, Stern Pinball, Williams, WPC | Permalink.